Entertaining friends and family at home is a great way to experience fun times and create memories that last a lifetime! At Pool and Spa Depot we realize that you're interested in more than just the specifications of a product, you're looking for products that bring joy and relaxation to your life. That's why we've taken care to put together one of the most expansive collections of home leisure products in the region. Whether you've been searching for the perfect solution for backyard fun with the neighborhood or an evening indoors with just a few friends, we've got you covered. Instead of shopping all over town to put together your ideal outdoor collection, let our associates help you select the pool or spa that fits your family along with the right mix of patio furniture, accessories, pool toys, water treatment products and more. And don't worry, we've got more than just summertime covered - we're committed to your year-round fun! When you're ready for cozy nights indoors, we've got plenty of fun in store. With our lines of saunas and billiards, get ready to experience a private getaway within your own home. 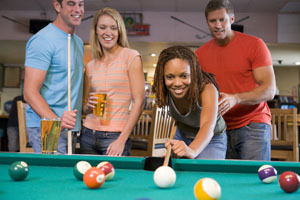 Bring the guys over for a night with you new pool table or retreat into the sauna for an intimate evening. Regardless of what you're looking for, we've got ways to make your home the perfect relaxation destination. Come to one of our locations today and let our team find the right combo for all your home entertaining needs!